CarGurus has 34,588 nationwide Tundra listings starting at $2,900. The 2007 Toyota Tundra pickup will grow in nearly every dimension for this new model year. The largest of the Tundras will stretch to nearly twenty feet, and a full eight foot bed will also be available. Toyota's full size pickup will be offered with three trim levels, three engine options, two transmissions, three bed sizes, and three cab configurations. 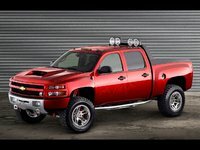 The result of these options will be more than twenty-five possible variations of the truck. Two engines will be continued from 2006: the base level 4.0 liter V-6 which makes 236 horsepower, and a 4.7 liter V-8. The larger engine produces 271 horsepower and 313 pound-feet of torque, but even that power supply was deemed inadequate by some truck enthusiasts. Toyota will now add a 5.7 liter V-8, and this all-alumium engine will produce an estimated 380 horsepower. Toyota will also utilize the continuously variable valve timing technology that was developed by TRD, and is current in use in several Lexus models. The VVT system will also transform Tundra into an ultra low emissions vehicle. 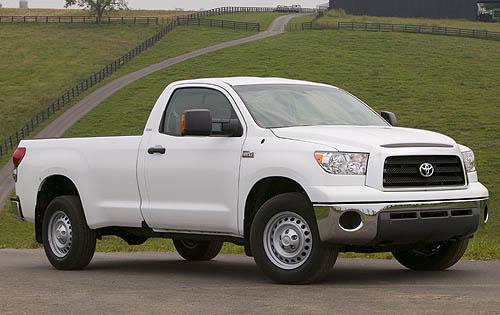 For 2007 the Tundra Access Cab is discontinued, and replaced by the similar Double Cab setup. 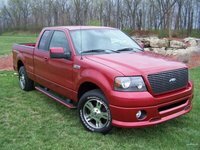 The truck will also be offered with the Crew Max (4-door) and Regular Cab. Both Regular Cab and Double Cab Tundras will be available with the eight foot long bed. An enormous 4-door Crew Max long bed version may also be in the works for later in the year. The Limited and SR5 trims can be added to the Crew Max and Double Cab models. The Tundra can also be had as a 4x4 or 4x2. While the Tundra's interior remains largely unchanged, with its driver-friendly instrument cluster and abundant passenger and cargo space, the exterior will be given a wider stance for a more aggressive and muscular look. 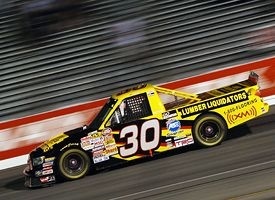 What's your take on the 2007 Toyota Tundra? Users ranked 2007 Toyota Tundra against other cars which they drove/owned. Each ranking was based on 9 categories. Here is the summary of top rankings. 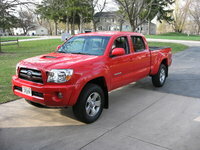 Have you driven a 2007 Toyota Tundra? Ok took my 07 tundra ,4.7 2wd, in to have the waterpump and timing belt changed,.... now the truck won’t start.... any answer? ?